KENNER, La. (AP) – The mayor of a New Orleans suburb banned the city’s parks and recreation department from purchasing Nike products, days after the athletic apparel maker released a controversial ad supporting former San Francisco quarterback Colin Kaepernick. The memo by Kenner Mayor Ben Zahn to the parks and recreation director says Nike products cannot be purchased for use at the city’s recreation facilities. It also requires the director to approve all athletic purchases by booster clubs using their facilities. The policy sparked a backlash over the weekend with many calling for it to be rescinded. Kaepernick ignited a firestorm in 2016 when he began kneeling during the national anthem as a way to protest police brutality and social injustice in America. He opted out of his contract after the end of that season and then has been unable to find a job with another NFL team. He’s suing the league for collusion. Zahn’s memo, written last Wednesday, and a statement Monday clarifying his position didn’t mention Kaepernick specifically. But in the Monday statement Zahn said while he applauded Nike’s message of inclusion, the company was promoting a “political message” to sell shoes. “In Kenner, like every city, our citizens and our taxpayers cover a wide spectrum of political philosophies and agendas. We must respect all of those agendas and philosophies. So, when a company uses its advertising as its own political megaphone, government should be fair to all of its people and not allow taxpayer dollars to be used to help that company push its own political agenda,” the mayor said. He added that people would be allowed to wear Nike apparel on city playgrounds. 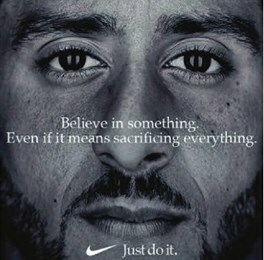 The Nike ban sparked protests and calls for the mayor to rescind the order. The Urban League of Louisiana questioned the legality of the action and said they were “deeply disappointed.” The organization said this was an opportunity to reflect upon the “real reason for associated protests regarding kneeling and police brutality” and called on the mayor and city council to rescind the policy immediately.